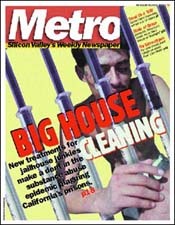 Drug treatment finally makes its way to California's prisons. Why did it take the state so long? Once a safe haven in the Macintosh universe, some local universities are becoming Mac hostile. At Santa Clara University, teachers even get a gold star for switching to a PC. West Valley: West Valley cities join anti-graffiti campaign. Saratoga: Coyote sightings, missing cats cause concern in hills. Campbell: Loop streets will become parking zones in an effort to slow traffic. Public Eye: San Jose councilgal Cindy Chavez says new gaming location is not in the cards. Light Speed: Local engineer rolls out solar car, prepares to run Australian outback race. Fusion by Design: Jazz drummer Billy Cobham shines on two new reissues from Purple Eagle. Delicious Duo: Cibo Matto fights against musical stereotypes on its new album. Aural Fixation: Local music mag BAM quietly folds. Last Year's Birds: Squishy 'Twice Upon a Yesterday' has everything except mimes. Pasta Perfecto: Palo Alto's Bella Luna is an affordable slice of Italy, with possibly the best pasta on the planet.